It's been a while since I've updated the theme of the blog, so I spent some time re-doing my blog. My main goal was to create something built for responsive. I was able to bootstrap my idea, with the Start Bootstrap - Clean Blog theme. This leverages Bootstrap for the base CSS and adds some specialized styling. I made a few tweaks to the template source, to adjust it based on the way I wanted. So, even with some of the negatives I'd read about the iPhone, I was definitely anxious to try a smart phone that seemed to be both a solid PDA and a phone—even if it was tied to iTunes and AT&T's network. It didn't take long to discover the iPhone was vastly superior to my old WM phone. The UI was intuitive and the device worked. Battery life was excellent and my only real issues with the phone were it's lack of a physical keyboard and it's dependency on iTunes—which I despise. Fortunately, once I found MediaMonkey I only needed to rely on iTunes for the occasional backup and firmware updates. Using MediaMonkey does end up requiring some patience, because Apple is constantly trying to prevent 3rd party applications from managing songs on the iPhone/iTouch/iPad devices, but if you're willing to wait for the developers of MM to work out the issues w/each firmware revision, the software works well and fits my setup much better than iTunes ever will. I hate the virtual keyboard – even after 2 years of use, I find I still end up tying "for" as "fir" and the auto-correction never helps me out. I just find it difficult to use and still too often it looks as if I'm pressing the correct key, only to have it register something else. Typing is a real chore for me on this device, so I try to keep typing to a minimum. Notification system – I hate how there's no central screen to see all notifications. This can be a problem if you have several missed calls, e-mails and text that all have occurred since you last looked at the phone. Apple's strict app approval process – I've seen apps ended up needing weeks to get bug fixes online and apps pulled for what seem no good reason. This draconian approach can be irritating—it's your phone, you ought to be able to do with it whatever you want. Lack of Flash – the refusal to include Flash used to really bother me, because it used to be really difficult to watch online videos. However, almost all sites now encode their videos in way you can watch the videos online now. Because of this change, the lack of Flash really hasn't bothered me much in the last year, although every once in a while I'd hit a site that required Flash and wish I had it. So, in my search to find the best phone I can, I thought I'd try my hands at an Android-based phone. I've known plenty of people who have gone from iPhones to an Android device and they seemed pretty happy. I was also wanting to get off AT&T and get back to Verizon Wireless—since they have without a doubt have a better network than AT&T. After much research, the wife and I decided on the Samsung Droid Charge. We played around with several phones at the Verizon store, but the wife and I both really dug the display on the Droid Charge and I was really digging Swype when playing around with it at the store. I also wanted to make sure I got a 4G phone, since I was getting locked into another 2 year contract. I ended up buying the phone from Amazon Wireless, because at the time they had the phone for half the price I could buy it directly from Verizon—which means I'd get both phones for the price of one phone directly from Verizon. The phones took 2 business days to arrive after ordering and I eagerly opened the packages so I could begin charging the phones so I could play with them after work. After playing with the phone for a week, here's how I view the Android experience. My initial opinion of the Android after playing it with it for a day was really poor. I constantly felt lost in applications, not sure how to perform actions that were always very intuitive on the iPhone. I found navigating an app with the separate buttons difficult and not intuitive at all. I had become so accustom to iPhone apps offering all the options onscreen, that go "back" in an app or trying to refresh a listing by hitting the "menu" button was not very intuitive. Also, actions that were single clicks/actions on the iPhone, generally involved at least 2 operations on the Android. Want to refresh your mail on the iPhone? Click the refresh button on the screen. That's one action. Want to refresh your mail in Android? Press the menu button, click refresh. That's two actions. Pretty much ever application I use frequently on the iPhone is like that. The Android way pretty much always involves more steps—many of them which were not intuitive. I also started really missing the ability to scroll to the top of a page by clicking in the status bar—which works in pretty much every iPhone app where the page scrolls. I've not found an equivalent operation in Android, and this makes using some Android apps painful—especially the browser. After the first day, I was really hating the phone, but I was intent on trying to give the phone a fair chance and wanted to use the phone for a week before making any rash decisions. So I kept plugging away, trying to use the phone as my primary device. I started liking the phone better after the second day of usage as I began to get the hang of how the phone worked. It's still nowhere near as intuitive or as efficient as the iPhone is, but at least I wasn't feeling lost any more. Maybe this Android thing isn't so bad after all! The battery life is also abysmal compared to my iPhone 3GS. I know the screen and increase in CPU power both will affect things, but even when the phone is in an idle state the battery drain is incredible. After playing around with some task killer applications, I can at least get a day of moderate use out of the phone, but there's no way the battery would last for 2 days—even if I wasn't using it. My iPhone on the other hand can go a couple of days easy on one charge w/moderate use. This leads me to my biggest complaint with Verizon. One of the reasons I left Verizon is because their phone selection was always poor. They never had phones that came close to their competitors. However, in the 2 years I've been with AT&T they've actually started getting much better phones. The problem is, they tend to be slow to update the firmware on the phones and their firmware is loaded with Verizon crap that you can't install. Whenever I run Advanced Task Killer, I constantly see Verizon apps re-spawning that I have no intention of every running (like IM, Daily Briefing, My Verizon Mobile, etc.) Obviously running programs that aren't going to be used affects both battery, but performance. Please let me remove programs I have no intention on using. The other issue is obviously with outdated firmwares. The Samsung Droid Charge is only like a month old—it's one of Verizon's newest phones. Yet the it's still shipping with Froyo 2.2.1. Why does Verizon always wait so long to release firmware updates? Android 2.3.4 came out in May 2011, but Android 2.3's been out since December 2010. That's not to mention that Android 3.0 was released in February and 3.1 is soon to be released. So, after a week of using Android I'm really thinking I'm going to abandon the Android device and go back to the iPhone. It's not all bad though, there are some things I really do like and love about the Samsung Droid Charge. Swype – Swype simply rocks. It's really great with long words and actually feels like a much more natural way to type on a virtual keyboard. The one downside I can see is that if you're not familiar with the QWERTY keyboard, it might be hard to know where to trace your fingers to form words (since your finger tends to cover the keyboard.) However, any touch typist should have no issues typing with Swype. It's truly a thing of beauty and Apple really needs to look at licensing the technology. Virtual Keyboard – the normal virtual keyboard is much better as well. The issues I have w/the virtual keyboard on the iPhone magically don't exist on the Droid Charge. Maybe this is because of the slightly larger keys, but I find typing the word "for" actually comes out "for" and not "fir" like it does for me on my iPhone. My only complaint is Android needs to remove the period, double the size of the spacebar and make double pressing the spacebar insert a period like in iOS. If they do that, the keyboard is virtually perfect. 4.3" AMOLED display – the display on the Droid Charge is absolutely beautify. If makes my iPhone screen seem dinky and ridiculous small. The screen is actually almost too big for me. I actually find the phone's a little harder to use with one hand because the phone is so big, but it's truly beautiful! My only real complaint is that if the brightness is turned down, the whites can be a little greenish—it gives photos of people a strange tint. Gmail app – the Gmail app really works great. I use Gmail for my personal e-mail and on the iPhone I stick to using the mobile web interface, as I really don't want my personal e-mail polling every time I check my work e-mail. However, the Gmail app on Android is very nice. I real like having a native app that gives me all the great functions of Gmail conversations. Camera – the camera on the phone seems very nice. I really like the HD recording capabilities of the phone and the camera has a lot of options too. I just wish there was a way to map one of the many physical keys to take a picture/record a video. Speakerphone – this thing is loud and crystal clear. 4G (i.e. 4LTE) – well I've seen some areas where Verizon's 4LTE network does indeed appear to be blazing fast (I've seen up to 15Mbps d/l and 6 Mbps u/l in Dublin) in my area (which is a mile from a Verizon store) I'm not seeing speeds any different AT&T's 3G network. Not really a huge deal since I'm mainly at my house on WiFi, but I was hoping to use the 4G network and my phone as a mobile hotspot when out and about. While it'll work, it's not as a good as I was hoping. Lock screen – after reading tons of great things about the Android lock screen, I was thought it would be more useful than it is. I find it very frustrating to get in a new text or phone and not have any insight to what the notification was about when I turn on the phone. Maybe it's just a matter of not finding a good lock screen add-on, but I was really hoping for something better out of the box. Flash in the browser – when I first bought my iPhone, I really thought the exclusion of Flash was a major missing feature. However, since 99% of the time I really wanted Flash on my mobile was to watch a phone, the lack of Flash on iOS has become less and less over time as most sites now offer video in a iPhone compatible format. However, I was really excited finally getting Flash on my phone as it would finally give me the full web experience. After playing with the browser for a week, I'm finding the reality of Flash on a phone isn't nearly as great as the idea of Flash on the phone. Since the vast majority of Flash on the web is ads, I'm actually finding Flash is slowing down my normal browsing experience because it's loading ads I'd never see on my iPhone. I'm not saying Flash is bad, but what I found I really wanted was either better native ad blocking or at least a prompt asking me if I wanted to run Flash on the current site. I think idealistically, the browser would ask me if I want to run Flash on a site the first time Flash tries to run for a site. If you tell it not to run Flash, each Flash element would turn into a button that you could click to enable Flash to run on that element. Widgets – I really thought this would be what set the Android device apart from the iPhone. What I ended up finding was a lack of really good widgets and the good widgets I did find, don't have enough configuration options. Browser – well the browser is ok in general, I find that there's two issues were the iPhone really shines. First, using the status bar to scroll to the top of the page. I find I'm really missing the ability to quickly scroll to the top of a page. The second issue is page rendering in general. For some reason the Android seems to render pages in a wider format and makes the fonts too hard to read. The iPhone seems to do a better job of rendering "desktop" sites and constraining them to a narrow width. This is really mostly an issue with websites that have a fluid layout, which is unfortunately the vast majority of websites out there. Phone layout – I find the layout of the buttons on the Droid Charge a bit of a pain to work with. The power/lock button is in a bad spot. I keep looking for it on top of the screen. It's also in a horrible spot for using the phone in landscape mode—the power button ends up being right where I want to hold my index finger to hold the phone. Only power buttons turns device on – I find myself expecting some of the other physical buttons to turn the phone on like on the iPhone. Front facing camera – the front facing camera seems nice enough, but with a complete lack of good Video Chat applications it makes the front facing camera in essence pointless. I mean I'm not the kind of self indulgent person that takes photos of themselves all the time, so unless you can give me a good Video Chat application, having a front facing camera is pointless. I've tried Fring, but the video quality is poor and the audio volume is horrible—you can't hear the other person at all. Tango has decent video, but the audio is completely broken on the Droid Charge—once you go to video call mode, the sound mutes completely. Applications lack polish – even though I used to consider the Apple App Store policies of app approval draconian, after a week of using the Android I can certainly see the benefits. The Apple apps generally have much more polish and generally work much better than their Android counterparts. It's also much harder to find good Android apps—there's a ton of rubbish out there. Verizon's pre-installed apps – I appreciate Verizon giving me lots of applications to choose from and it makes sense to pack the phone full of features for users who may not look in the Android Market, but please, please, please let me uninstall the crap I don't want. I find there's a handful of applications that keep starting in the background that I will never use. I should be able to uninstall the applications I don't want on my phone, without having to resort to the drastic measure of rooting a phone. Poor battery life – you really have to work to get your Android device to make the battery last. This reminds me of my poor experiences with Windows Mobile. Seems like I constantly have to kill apps to improve my battery life. Last week, I unplugged my Droid Charge at 4pm before heading to my golf league. I made one 4 minute phone call (on speaker phone) and then turned the screen on a couple of times (for no more than 3-4 minutes total.) When I finished my 9 holes of golf, I looked at the phone and released my battery was done to 67% charge. My iPhone had been off the charger since 7am, had been used way more and was still at like 94% charge. I've finally got the battery life to the point where I think maybe it's manageable, but I feel like it's work. Unless I have extreme usage of my iPhone, I never need to charge it during the day. However, with the Droid Charge I'm pretty sure I can't be too far from a charger. IMAP – appears to be extremely buggy. I'm having too major issues that are a deal killer for me. Every time I refresh my IMAP e-mail, all the e-mail shows as unread (even the mail that has already been marked as read.) I might be able to live with this if I could easily select all the message in a folder, but this behavior is extremely annoying. I did some Googling and this seems to be a common problem for some people, but not common enough that there are any fixes—other than using a different e-mail client, like K-9. The problem is, I refuse to use 3 different e-mail programs to check all my mail. I need Exchange/ActiveSync support and only the native Android e-mail client appears to support it. Starting yesterday, every time I try and pull my IMAP e-mail I'm getting the error: "The application Email (process com.android.email) has stopped unexpectedly. Please try again." This appears to be the problem parsing certain e-mails and the only current fix for Froyo appears to be to wipe the data, remove the corrupted e-mail using another client and then restoring all your mail accounts. This bug appears it may be fixed in Gingerbread, but who knows when Verizon & Samsung will decide to push out Gingerbread to the phone. ActiveSync – while it doesn't happen all the time, a handful of times over the past week I've had issues w/my ActiveSync account telling me the password was corrupted and needed to be re-entered. Since this happens without me being notified, it makes push mail completely unreliable. I need stable push mail, because that's how I have all server notifications, support tickets, etc sent to me. I need to know that push e-mail is reliable and works without random failure. No scroll to top – I find the inability to click on the status bar to scroll to the top of the window a function really missing from Android. You'd think with all these physical buttons, you'd have some way to jump to the top of the page—like with a long press of the menu or back button. Phone layout – well already mentioned in the previous section, I find the placement of the USB charger to be horrible. The phone becomes extremely difficult to use when you're charging the device. I could live with it if the phone didn't need to be charged so much. The USB port should really be on the bottom of the phone. No silent button – I find the lack of switch to mute the phone a problem. The only way to turn off sound is to turn the device on—which means you have to pull the device out of your pocket and light it up. I love that with my iPhone I can just reach in my pocket and turn the phone to silent without having to pull the device out of my pocket. It's a quick one handed operation. I really, really wanted to love this Android device, but the more I use it the more I realize the iPhone is superior for me. It appears many of my issues may be addressed in newer versions of Android OS, but Verizon and especially Samsung have a bad history of basically abandoning firmware updates after 6 months of a phone being released. I'm sure that Gingerbread will eventually be released for the Charge, but I'm beginning to doubt whether I'll ever see 3.0 or 3.1 officially released for the phone—which is a real shame. These mobile carriers are in such a hurry to release a new crop of phones every 6 months, that they stop improving their existing phones. If the carriers are going to lock you into a 2 year contract, then they out to be guarantee that they will keep the phone up-to-date with the latest firmwares over that 2 year period. Many of you may know that the wife and I have our first baby due this Spring. One the things I've been researching since I found out the wife was pregnant has been IP cameras. I really like the idea of being able to check in on the baby at any time to make sure she's ok—without actually walking in and risking waking her up. After looking at some baby video monitors (which didn't meet all the above requirements anyway) I realized that they're all over priced and most got pretty poor reviews. I was leaning towards getting an IP camera anyway, so this made the decision easier. After looking at many different models, I ended up purchasing the Foscam IP Wireless/Wired Camera (Model: FI8908W). I looked at a few Axis cameras, which are great cameras, but really more expensive than I wanted to pay and really way more than I needed. I also seriously considered getting Astak Mole IP Camera—it met all my requirements, but just was a little more than I wanted to spend. Then just last weekend I stumbled across the Foscam camera. It met all my needs and I could get it shipped for around $95. The camera uses MJPEG for streaming video—which doesn't natively support audio. There is an ASF streaming URL you can access (which supposedly includes audio,) but I haven't found the necessary codec to view it with Windows Media Player. Supposedly VLC will play the stream fine, but I don't want to install another app if I don't have to. Terrific night vision—I was really impressed with the quality in a pitch black room. Pretty straight forward setup. While I found it easy/quick to setup, someone without good gadget skills might struggle a bit. Decent integrate web-interface. While it has lots of options, it's not particularly user friendly. Fortunately, you can give out URLs straight to the stream for family members. Multi-user configuration. You can have up to 8 separate user accounts. Users can either be an Administrator, Operator or Visitor. An Operator can do everything but change configuration—including changing the camera pan/tilt. A Visitor can only view the picture. The picture quality is a little washed out, but seems to do well in low lighting. I've heard that replacing the lens can improve the coloring, but I think it's sufficient for monitoring purposes—I don't need exact color matching. I would definitely say the camera is well worth the $100. I'm still playing around with it, but there's a nice iPhone app called Foscam IP Control for $1.99 that allows you to remote view the camera and alter the pan/tilt (it does lack a full screen mode.) Since I'm still not sure how I'm going to expose the camera to the world, I may end up changing apps but it works well. So far this seems like an excellent way to monitor my sleeping baby and give the out-of-town grandparents a way to keep up with the baby too! For Christmas this year, the big family gift was a new Samsung PN58B860 58" Plasma TV. Our old TV worked fine, but with the baby on the way I we wanted try and reclaim some living room space—much of which was being taken up by our old Mitsubishi 55" rear projection TV. We absolutely love the picture, but from day one we started running into a problem with the TV in which it would just randomly power off and then immediately back on. I went through a battery of tests trying to determine if it was a power issue, cable issue, etc. I tried replacing the HDMI cable, hooking the TV up directly to the cable, changing outlets, etc. Nothing I did resolved the issue. Since the problem was random (on average, probably happened once an hour, but we might go a couple of hours with no issues or it might happen several times within a few minutes.) It didn't matter what we were watching—could be cable TV, a DVD, playing XBOX, etc. The TV would just turn off and then turn right back on. After talking to Samsung and HH Gregg everyone seemed to think it was the power supply on the TV and since the TV was less than a week old, HH Gregg delivered a replacement TV. However, the new TV was having the same problem. So, once again I started going through my battery of tests trying to figure out what was wrong. After testing tons of things, I finally found the root case—the Internet connection. Since now the TV was acting as a DMZ, all unrecognized traffic was being routed to the TV. I suspect what was happening is various ping and exploit attacks on my IP address was causing problems with the TV, so the TV would just shut down and power up again. I just never thought that the Internet connection would be the root casue of the TV rebooting. Anyway, if you have a Samsung TV that's recycling the power, try unplugging your Internet connection and see if that improves the situation. Also, never run a device as a DMZ unless you know what you're doing! Today started off horribly. But before I get into today, I have to backtrack a bit. While I haven't blogged about this yet (because it's still very early,) my wife is pregnant. Getting pregnant has been a long process for us and something our family and close friends have known about. Because so many people have known what we've been going through, we announced it to close friends and family a little sooner than we'd probably have liked. Last Monday at 5am, Jenn woke me up and she had passed a clot. From the look of things, I was really afraid things were bleak. Jenn continued to spot all last week, so I was really worried that something went wrong w/the pregnancy. The doctor's didn't seem overly concerned and we just needed to wait out our appointment which was scheduled for today at 10a. Needless to say, last week really sucked. We were trying to stay optimistic, but I was preparing for the worst. When we saw the doctor we explained what had happened. He didn't seem overly shocked (because we had kept him a breast of the spotting) but I was surprised he didn't seem as concerned as we were. So when the ultrasound started, I was really trying to figure out how to comfort Jenn, just fearing the worse. Much to my surprise, I saw a similar black blob as we did on our ultrasound on 9/10, but I was still hesitant to get my hopes too high. However, within seconds a little peanut shape emerged from the blackness and once again we saw the little fluttering of a heart. After basically preparing myself of the worst for the past week and then just feeling like my thoughts were confirmed this morning, I can't even begin to explain the emotions I was feeling--to say it was a relief doesn't even begin to explain it. We even got to hear the heart for the very first time. The heartbeat was very healthy and was over the healthy 150 beats per minute they like to hear. While we're still not sure what's causing Jenn's spotting, the doctor didn't find any lesions--only another smaller clot and he doesn't feel like it's threatening the baby. So everything looks to be going great. The bleeding is still a concern, but thankfully the baby appears healthy. It's funny how quickly your life can change with just the lubb-dub sound of a heartbeat. I've always heard how life change on a heartbeat, now I truly understand. They've been facing a backlash about this decision and rightfully so in my opinion. As I stated earlier, my current download usage isn't very high, but one of the immerging Internet markets in downloadable movie rentals. When the XBOX360 introduced it's Netflix interface for watching streaming movies online, I thought that was a huge jump forward in downloadable movies. Well the Netfix streaming library is still too sparse and doesn't include enough new movies, that will change over time. I certainly see a time in the near future where you'll be able to rent movies purely online. This is why I'm so irritated with download caps. We're seeing more an more Internet based services succeeding. We're seeing more SaaS applications having success, streaming video taking off and of course iTunes has seen great success. All of these services share one thing in common—they require downloading content to use the services. If TimeWarner really needs a way to help recover costs, don't limit how much I can download, limit how fast I can download it. TimeWarner has kept bumping up the bandwidth transfer rates, but most people don't need 6Mbps or 8Mbps sustained xfer speeds. I'd much rather see them keep the tiered xfer rate pricing and keep the uncapped download speeds. Let the people who need the higher transfer rates (because their transferring tons of data simultaneously—which is where the real problem lies anyway) and let the rest of us just download the data we need without having to worry about our download usage. This really makes me hope Verizon bring FiOS to Central Ohio sooner, rather than later. Verizon currently has no plans to cap their download usage and the xfer rates are already much higher than TW. If TW does implement download restrictions, that will be the straw that broke the camels back. Not only will they lose me as a RoadRunner customer, they'll probably lose me as a Cable subscriber as well. One thing that really irks me about Google's implementation of IMAP is that when you "delete" a message in Outlook, it doesn't move the message to Google's "Trash", but instead just removes all the labels. Since Gmail doesn't have a good way to view just unlabelled messages, it makes it a pain to clean things up. The only thing I've found that really works is to build a huge search filter excluding all my labels—which is horrible. Well, I logged in to my Google Apps mail tonight and Google finally decided to roll out "Themes" to my Gmail. I'm not sure why it took them so long, but at least it's hear. What's really weird is most of the other "Lab" tools seem to arrive pretty much in sync with everyone else—but they really waited to give me access to the Themes. Anyway, I can finally change up my Gmail mailbox! Well, I spent some time this afternoon upgrading my version of BlogCFC. This was a bit of a task, because I had fixed a number of issues I've come across in the past few years. However, Beyond Compare 3 made this task relatively painless—a bit time consuming, but painless. I was able to merge my version to BlogCFC v5.9.004 in just a couple of hours. Anyway, if you notice any problems with comments or any errors in general, please let me know. This really irks me. Sirius has forced the guys at NiceMac to shut down their services and pull their applications from the web. I think I'm more irate by this announcement than when I head that they were getting rid of their free basic streaming service for members. In my opinion, they should offer some form of streaming to all customers. There are still too many situations where you can't get an antenna in place in order to listen to your radio. My office is in the basement and the streaming option is really the only decent solution. Every attempt to get an antenna working well in my house has been futile—I just end up with very flaky audio. However, for the past 4 years or so (or whenever their streaming went online,) I've been very happily listening to their streaming service via the Internet. My only complaint was their native interface. Since I really only listen to talk radio, the 32Kbps stream is more than fine for me. I don't need a high quality stream—I just want an interface that doesn't make me keep clicking buttons to keep the stream open. This is where 3rd party applications come in. For the longest time I was very happy with Tanner's original Sirius Yahoo! widget. As a matter of fact up until two weeks ago, I was still using the widget. However, when I was forced to move to Vista, I decided not to load the Yahoo! 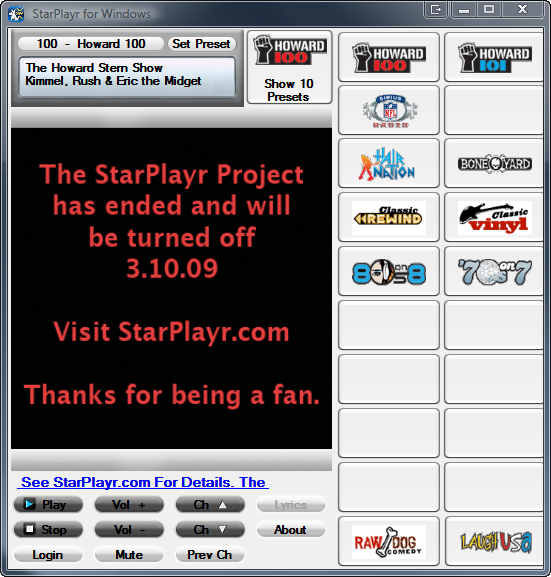 widgets engine (since I really only used it for the Sirius tuner) and instead installed StarPlayr. While not perfect (and many ways I prefer the simplistic interface of the Yahoo! widget) it makes online listen a breeze. Just start the app and listen away. No annoying pop-up windows, no having to re-login in every morning and most importantly no need to keep clicking a button to keep the stream alive. So, it looks like as of tomorrow the stream may stop. I'm hoping the application will continue to work. I hate to spend time hacking together a solution that works. I may also try loading up the Yahoo! widget in a VM to see if it's still working when Sirius goes online with their new service. If anyone knows of any good Windows alternatives, let me know. If I find one, I'll try to share. I prefer something that works outside of the browser—since frequently restarts of my browsers are often required as a web developer. I want an application I can run in the background and keep enjoying programming like Howard Stern and the NFL Radio. If Sirius continues to make it difficult to listen to their service, then I really won't have a need to continue using their services. I know there are plenty of other people who feel the same way. I've already seen a lot of people who are shutting down their service because Sirius is no longer offering the free stream. I know Sirius' finances are hurting and losing customers is the last thing they want to do. A year ago today our Black Lab, Nikki, underwent surgery to have her canine cruciate ligaments repaired in both rear knees after having ruptured them. It was rough day for the wife and me and I'm glad it's well behind us. Nikki's been doing excellent since the surgery. Other than a slightly strange gate (which is only really noticeable if you're looking for it) you would never know she had both knees replaced. Last summer she enjoyed many a days running and playing ball in the backyard. Occasionally the knee would "give out" on her when she'd try to make a quick cut and she'd come up limping, but I think she limped only because it felt foreign because within minutes she was back to running and jumping at full speed.